Greenways provide safe & accessible corridors for active recreation and non-motorized transportation through parks & on streets. DOT is responsible for the planning, design & implementation of greenways on city streets. Help plant the Greenway this Friday, Sept. 16! Help plant the Greenway this Friday! On this section of the route we are examining how a greenway can be built from Valentino Pier to Erie Basin Park, behind Ikea. Brooklyn Greenway Initiative’s monthly clean-ups continue along the Columbia Street section of the Brooklyn Waterfront Greenway. Please join us on Saturday, September 10th, from 10:00AM-12:00PM. This is one of the most beautiful and peaceful sections of the waterfront. In planning the route, DOT must reconcile the desire for waterfront access with an active commercial and industrial waterfront. Route A (shown in blue) passes through Atlantic Basin. 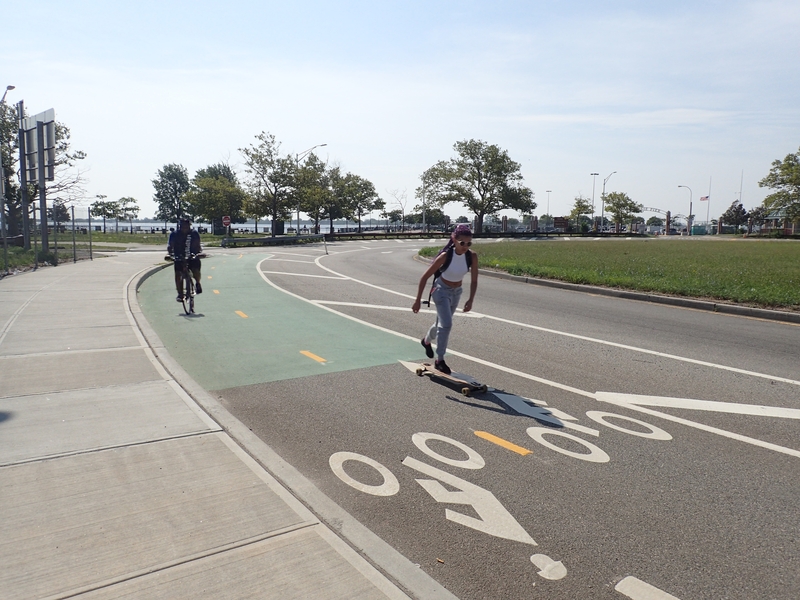 Take part in Brooklyn Greenway Initiative’s 3rd Annual Brooklyn Waterfront Epic Ride. Ride 40-miles, 14 of which is on the future Brooklyn Waterfront Greenway. As part of the NYC Department of Transportation Urban Art program, the city has partnered with New York Cares to commission professional artists to create temporary designs on city-owned infrastructure. Construction continues to progress on the creation of a new park at the site of the old WNYC radio broadcasting building along the future West Street section of the Greenway route in Greenpoint. Jersey Barriers were first invented to prevent cars from veering into oncoming traffic on the New Jersey Freeways. Due to their portability and design, they are now used for a variety of uses. Don’t miss all the music on the Williamsburg waterfront this summer. Take the greenway along Kent Avenue to East River State Park at North 8th Street and enjoy the summer concerts going on through September.